Evergreen - White Styrene Strips 015 x .020 Discounts Apply ! 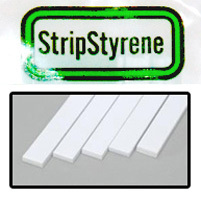 Evergreen White Styrene Strips 015 x .020 - Evergreen Scale Models is the world's largest producer of styrene plastic shapes, strips, and sheet materials in metric and inch sizes. You can build clean, accurate models using Evergreen Styrene Plastic strips.